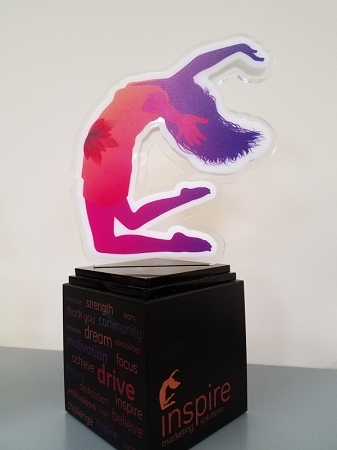 The Inspire Award for those who inspire us! The Inspire Award was made for the inspiration in your community. For those who inspire others and motivate us all to be better people. This one-of-a-kind award is customized to be uniquely yours. Made of layered acrylic set in a black wood base with a multiple surface color imprints. Includes two imprint colors, and more are available. No PMS color match. Available in 4 sizes. Add your custom message or logo to each side. Please allow 10 to 14 working days production time. Order online and we'll follow up to discuss the design details.